Crazy Polish Lady – Another Mojito, Please! It’s Monday again! I hope everyone is off to a great start with their week :) Today I have Crazy Polish Lady Another Mojito, please! for you. This is from the limited edition Summer Is Up collection. Even though this is a summer polish the colors go great for fall and winter too. This crelly polish has quite a unique and lovely color combination! For this mani I used two coats of Another Mojito, please! with G & G HK Girl top coat. Formula was good and the application was nice and smooth which is usually the case with Crazy Polish Lady polishes. This was opaque on two coats but with my long nails it would’ve not done any harm to add a third coat. With two coats the result was smooth enough so I didn’t need Glitter Food before the top coat. Crazy Polish Lady has recently opened her own webstore. This polish is still available along with previous collections and a very stunning looking new fall collection. So go check it out! You can also follow her on Facebook. ***Another Mojito, please! was sent for review, other products purchased by me. I do not benefit from clicking the links on this post. Hello lovelies! It’s a lovely, sunny Saturday here in Finland and I’m going to try and get two posts up for you today. I’m a bit behind on my reviews and blogging at the moment. My year and a half old has decided that it’s a great idea to first fight going to sleep for a nap and then on night time she likes to run around till 11 pm. We put the kiddos to bed around 9 pm and she fools around till 11 *sigh*. I need to get up every two mins to take her back to bed. So it’s pretty much impossible to get anything done before she passes out and by that time I’m usually too exhausted to even think about nail polish. Oh boy, I hope this sleeptime craziness passes soon. 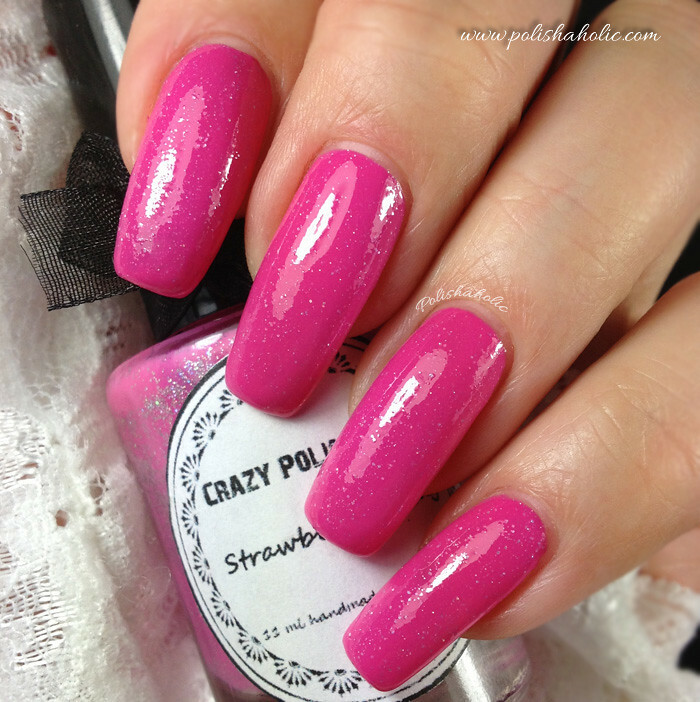 Either way, here’s the gorgeous Summer Love by Crazy Polish lady. This is also from the limited edition Summer Is Up collection. I have previously reviewed a couple of other shades. 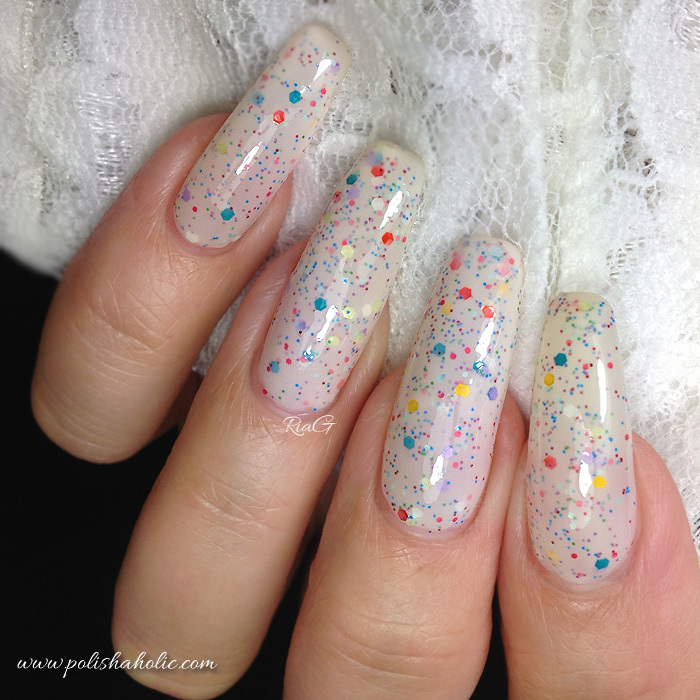 This one is a white crelly polish with light blue and light pink glitter. This is three thin coats with, Glitter Food and G & G HK Girl top coat. Crazy Polish Lady lives in Portugal and she ships internationally. She doesn’t have her own store yet but you can message her on her Facebook page or email her carvalho.sophie(@)gmail.com and place an order. Some of her polishes are now also available at Mei Mei’s Signatures. ***Summer Love was sent for review, Glitter Food and HK Girl were purchased by me. I don’t benefit from clicking the links on this post. The formula is absolutely fabulous. 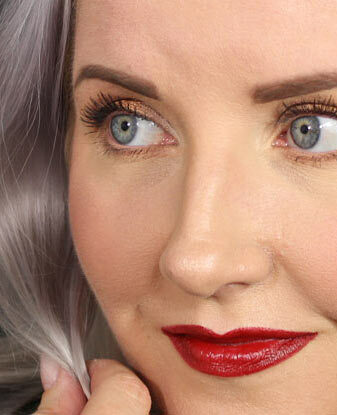 Application is smooth, flawless and opaque in just two coats. Glitter applies evenly and no fishing needed. Perfect! If you haven’t tried any of Sophie’s polishes yet, you’re missing out! Each and every one I have tried have been nothing short of excellent! ***Sand in My Flip-flops was sent for review, HK Girl was purchased by me. I don’t benefit from clicking the links on this post. This is three thin coats of Yellow Polka Dot Bikini with G & G HK Girl top coat. ***Yellow Polka Dot Bikini was sent for review, HK Girl was purchased by me. I don’t benefit from clicking the links on this post. Hi and happy Friday! Today I have a gorgeous Crazy Polish Lady shade Violet Hills for you. This is from the “Colors are the music of my life” collection and I have previously shown you a few other shades too. Like the other ones I have from this collection this is also stunning and I just love the color. Violet Hills is a crelly polish packed with holographic micro-glitter. This shade is amazing and it might just be my favorite out of the collection by far. So very pretty! This is three thin coats of Violet Hills with G & G HK Girl top coat. Crazy Polish Lady lives in Portugal and she ships internationally. She doesn’t have her own store yet but you can message her on her Facebook page or email her carvalho.sophie(@)gmail.com and place an order. This collection is now also available at Mei Mei’s Signatures. Enough with the babble, let’s talk about today’s polish. This is another pretty creation from Portuguese indie brand Crazy Polish Lady. Cinderella shoe is from her second collection called “Memories in Colors”. This has a lot of white hex glitter and smaller holographic glitter on a clear base and this is meant to be used with a base color. You can practically wear this with any color you can imagine. I layered it with two Crazy Polish Lady shades I have previously reviewed Strawberry Swing and Cosmic Love. I used a sponge to do a gradient over Strawberry Swing. I really loved how this turned out. The glitter pieces also laid flat enough and I didn’t need to use Glitter Food to smooth it out. This is two coats of Strawberry Swing, couple of coats of Cinderella Shoe sponged and G & G HK Girl top coat. Next I tried this with Cosmic Love. I sponged a reversed gradient on three fingers and on the ring finger I applied two regular coats on a whole nail. So this is two coats of Cosmic Love, two regular coats on the ring finger and two coats sponged gradient on the three other nails plus G & G HK Girl top coat. Application was good and glitter came out of the bottle easily. I really like the white glitter and the holographic glitter gives this polish a lovely sparkle. Crazy Polish Lady lives in Portugal and she ships internationally. She doesn’t have her own store yet but you can message her on her Facebook page or email her carvalho.sophie(@)gmail.com and place an order. Her first collection is now also available at Mei Mei’s Signatures. ***Cosmic Love and Cinderella Show were sent for review, Strawberry Swing and HK Girl top coat purchased by me. I didn’t have too many choices for U and none of the old polishes really called my name. Instead this new purchase I was dying to try so this week I have another Crazy Polish Lady shade for you. This time it’s Under the Sea from the “Memories in Colors” collection. 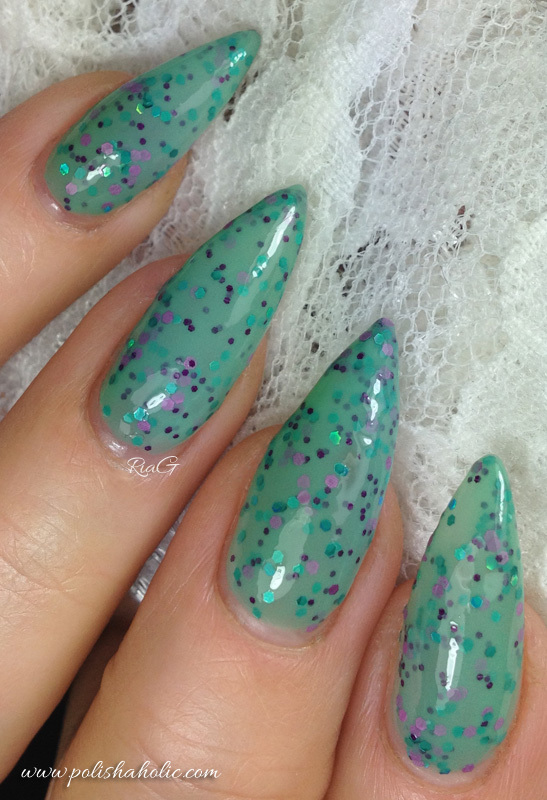 This is a pale aqua green crelly with turquoise, light green and white glitter. I really love the soft base color and (even if I really love my glitter bombs) it’s a nice change that this isn’t crazy packed with glitter. This is two normal coats of Under the Sea and G & G HK Girl top coat. Under the Sea applies really nice and smooth. Two coats is enough for opaque result and dry time is very short. Like most crellys this one also creates a lovely sandwich effect. I have been impressed with every Crazy Polish Lady polish I have tried by far. Excellent quality! Crazy Polish Lady lives in Portugal and she ships internationally. She doesn’t have her own store yet but you can message her on her Facebook page or email her carvalho.sophie(@)gmail.com and place an order. ***All products used were purchased by me. Today I have another Crazy Polish Lady pretty for you. 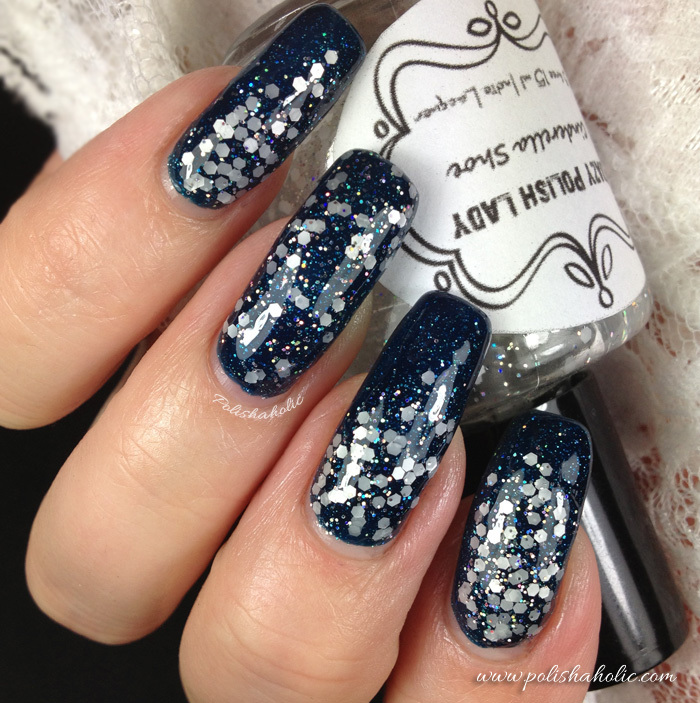 This is Cosmic Love, a deep teal-ish blue crelly with holographic micro-glitter. This is one of the eight shades from the “Colors are the music of my life” collection. I now have five of the polishes in this collection and I feel like I really need to get the remaining three shades too. All the polishes I have from her are absolutely gorgeous! This is two coats of Cosmic Love and G & G HK Girl Fast Drying + Super Shiny top coat. Cosmic Love applies well and is opaque in two coats. Dry time is fast and removal is not too bad. 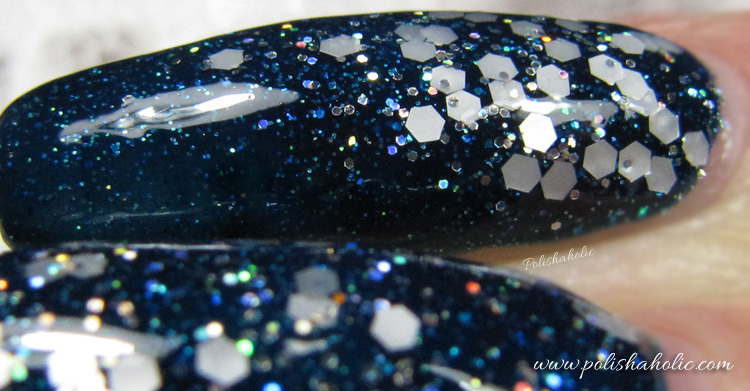 In this one the holographic micro-glitter is quite visible and the color is very beautiful. Cosmic Love reminds me of a starry night sky. Just stunning! ***Cosmic Love was sent for review, HK Girl top coat purchased by me. For this week I had a plenty of choices but I was also dying to try out my new Crazy Polish Lady polishes. Luckily one of them is called Strawberry Swing ;) This is from the “Colors are the music of my life” collection which has eight awesome shades. Strawberry Swing is pink perfection in the bottle! Application is flawless. I hardly even needed to do any clean up. Two coats is enough for opaque result. This is packed with holographic micro-glitter so it dries a little rough and top coat is definitely needed. I absolutely LOVE this color! 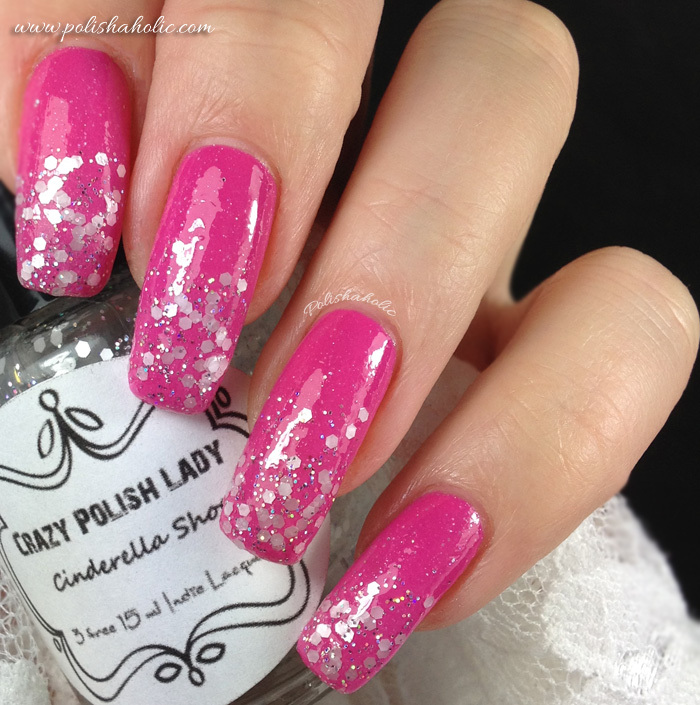 Bright, clean pink without being neon and the micro-glitter gives it the extra little twist of goodness. I have previously tried two other polishes from this collection and both had the same excellent quality and formula this one has. Crazy Polish Lady lives in Portugal and she ships internationally. She doesn’t have her own store yet but you can message her on her Facebook page or email her carvalho.sophie(@)gmail.com and place an order. No Leaf Clover applies perfectly. Two coats is enough for opaque result and dry time is short. Again I didn’t have any sunlight to photograph this with so photos are taken with daylight bulbs. On the photos I have two coats of No Leaf Clover and a coat of HK Girl top coat. Eyeshadow Stamping Wet n Wild Studs China Glaze Oumaxi Essie Lookfantastic Beauty Box Subscription box Base coat KIKO A England Born Pretty Store F.U.N. Lacquer Blush Urban Decay Glitter Gal Gradient Color Club MAC Nail growing Acrylic paint Dance Legend Pure Color 10 Rhinestones Bliss Kiss Cuticles Jindie Nails O.P.I. Dollish Polish Delush Polish Mavala Lipstick Illamasqua Polishers Inc.